OKC Sandblasting can service all your Sandblasting needs! If you're in need of surface treatment for a variety of different materials, there are many reasons why you should use a professional blasting service. Blasting is born from the word sandblasting and is applied to various surface material types to clean, smooth and refine the surface so that is looks as good as new. Blasting techniques vary widely and restores the surfaces that are worn due to dirt build up, age and often overuse and more. When the technique is used small fragments of material are blasted at super high speeds to clean the surface. Blasting can remove dirt, dust, oils and grease from the surface. Using a sandblasting service is good for stripping or smoothing a surface, cleaning pavement or any other surfaces. Also it's a great alternative to many other methods used for restoring surfaces. Although you'll need professional service, sandblasting is a fairly comprehensive job. While completing a blasting project, professionals are able to provide a non-strenuous yet, easy and quick clean up. Oklahoma City Sandblasting professionals are highly skilled at surface blasting and the removal of extra material when the process is completed. It’s a versatile services, not only for pavement as most commonly used, but other mediums as well. ​Paint can be removed using a dustless blasting process. While abrasive blasting refines surfaces by giving it a high quality polished finish, a professional service guarantees that there will be no dirt or contaminants left behind on the finished surface. Abrasive blasting is a common surface preparation method for different surfaces like wood, stone, concrete, and metal. It is an environmentally safe way to successfully remove elements like grease, dirt and, even old paint from many surface types. 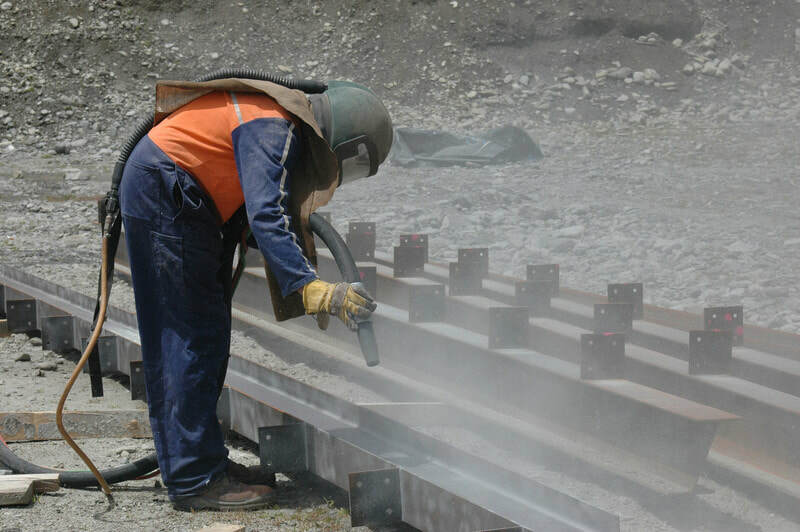 There are two types of general blasting methods used by professionals when it comes to sandblasting surfaces which are wet blasting and dry blasting. Wet sandblasting techniques applies the process of streaming water mixed with other material which can be abrasive, at high powered speeds for removing elements from any surface. 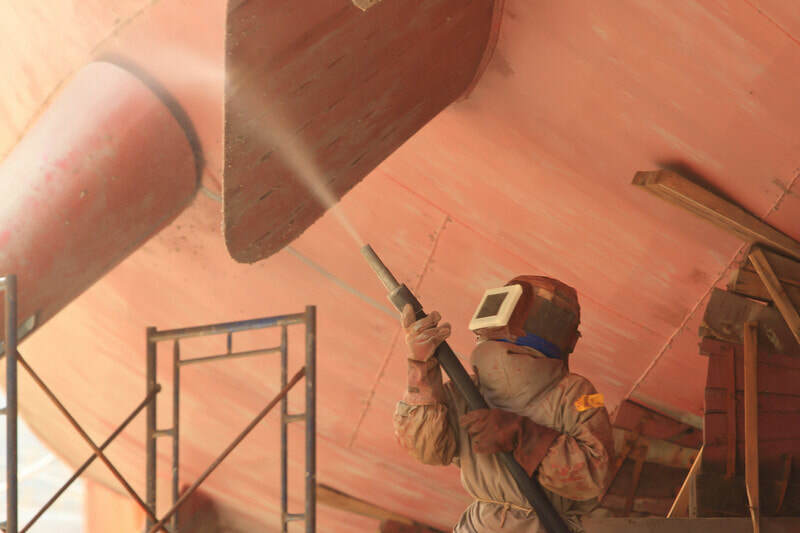 The procedure for dry dustless blasting involves the mixture of abrasives blasting in conjunction with a rapid and highly pressurized air blow. Both methods are advantageous to use across different surface types, but these methods differ and have their own specific benefits for sandblasting use. Despite this fact, wet blasting is safer, easier and a faster technique to clean off and prepare surfaces for restoration. Wet blasting is highly effective as the degree of blasting is easily adjustable for a broad range of procedures from delicate cleaning; like dirt, dust and old paint removal cleanings to hard and rough cleanings which will include cutting, roughening, shaping and smoothing surfaces for refining and/or refinishing. Of the two general blasting techniques, it’s a bit more powerful than using sandpaper and this allows blasting professionals to prepare many surfaces types in a matter of hours, shortening the technique for blasting time. However, steam cleaning or pressure washing is a priority for effectively blasting metals to prepare the surface for painting if applicable. ​Although dry blasting is considered more dangerous and harmful to the immediate atmosphere around than wet blasting, you'll find that most companies today are using wet blasting techniques. In any event that dry blasting has to be applied to surfaces, special permissions may be needed from the city or county, in order to dry blasting as it is a risky procedure. It's crucial to know the different variety of blasting medias, since the different types of media blasting abrasives are used for different technique applications. Blasting media is ultimately used for stripping, etching, polishing, strengthening and definitely cleaning. Additionally, with the different media blasting types, the grit and mesh size is what also plays a crucial role in the application for blasting. Depending on the type of work that needs to be done, the result in choice of media determines the blasting type and equipment that's being used for the blasting service provide by a professional blaster. ​Below is the different types of commonly used medias for blasting, whether it's applied in wet blasting or dry blasting. Pumice is a natural source media that has a mild abrasive quality for delicate blasting projects. ​It is a naturally light mineral that's ideal for less aggressive procedures, in which surface protection is crucial and of extreme importance. Pumice is a great media for delicate woods, glass and metals. Aluminum oxide is a more commonly used safe abrasive in blasting finish and surface preparation. This media provides a sharp and fast working abrasive that's easily well suited for wet and dry applications. ​While a lot of blasting abrasives are not suitable for because they can cause certain risks, Aluminum oxide is highly ideal for extremely tough pieces to work on especially, rooms and metal and hardwood cabinets. Aluminum oxide is also a cheaper alternative to most of the other medias that can be applied in the blasting. Glass bead media provides surfaces with a much brighter and smoother surface after blasting. The media is lead-free, with no silica and is made with a type soda lime glass. ​The glass beads are always manufactured in the shape of a preformed ball and is environmentally friendly as it's a recyclable material that can be recycled more up to 30 times. Steel grit is a great media for high demand and aggressive applications. The steel grit provides rapid stripping action for a vast variety of different types of surfaces. ​It's great for stripping contaminants from steel metals and other foundry metal types. Steel grit media is ideally softer than aluminum oxides but still provides the angular shape that is also found in aluminum oxide. Steel grit is fracture-proof and is the perfect solution for etching on a variety of metals. Using silicon carbide, this is the most durable blasting media on the market. It also provide a faster cutting speed than most media. ​Silicon carbide comes in a blocky grain shape that will splinter to effectively etch a surface. Silicon carbide is a highly recyclable media more than most alternative medias. It is also very effective and ideal for etching stone and glass. This media provides a non-toxic, no silica aggressive abrasive for blasting. This media is ideal for doing profiling on surfaces and coating removals. Crushed glass grit is also great from successfully removing surface contamination from many different surface types. ​Crushed glass grit contains no heavy metals that are found in medias like coal and copper slag. Since this media is a super light media is applicable for delicate surfaces due to the nature of its angular crushed grits of glass. This media comes in a good variety of different types that will deliver an effective fast stripping rate and also high quality consistency when using plastic abrasives. Plastic abrasives are great for stripping paint and coatings from aluminum and a variety of different metal types, as well as composites and different plastics. ​The softness of this media makes it advantageous for abrasive blasting for aerospace and automobile blasting applications. This type of media will ensure the protection of your aerospace and automotive metals, while providing a safe blasting environment. This media is a popular media for stripping and cleaning metal surfaces. Steel shot will also improve metal surfaces drastically. Generally steel shot is designed into a ball that gives metal types a high quality smooth and polished finish on the surface. The preening action of the steel shot will increase the integrity of metal surfaces, by improving the strength of the metal surface. For those who live the organic lifestyle there are options for use of organic media as well for blasting. With new blasting techniques always underway for using environmentally safe materials, there are many new organic material making their way to the market for professionals to use in shop for blasting a wide variety of different surfaces. These organic medias are great and effective for dedicated and durable surfaces. Walnut shell grit media is an organic and biodegradable way to sandblast a surface without causing any damage to the surface. It is solely used for procedures that requires a lot of aggressive power for stripping and cleaning surfaces. ​The walnut shell grit provides an angular shape with durable impact as a soft abrasive. Walnut shell is good for application such as cleaning hardwood and stripping automobiles, and it's even great for stripping of aircrafts as well. ​This media is organic and has a soft blasting quality that is great and safes for delicate parts on surfaces. Cob is a highly popular media for wooden surfaces, especially homes like log cabin homes. Corn cob provides fantastic cleaning and stripping properties, that's great for an overall finish without damaging the wood of any surface. ​For the maintenance and care of your boat blasting is vital for the lifespan and value of your boats. Pressure blasting your boat is a successful technique for stripping the paint from the hull of your boat to prepare the body of the boat for refinishing. Depending on the nature of work that needs to be done, the right blasting media will be applied for the best outcome. ​Soda blasting is a technique that we use to apply for cleaning, stripping paint and varnish, machinery restoration, automotive restoration, graffiti and rust and oil removal and more. We use soda blasting as a non-destructive way of restoring many surface types of metals. Also soda blasting is one of our environmentally safe options for you to choose from for restoring your equipment, metals and even automobiles. 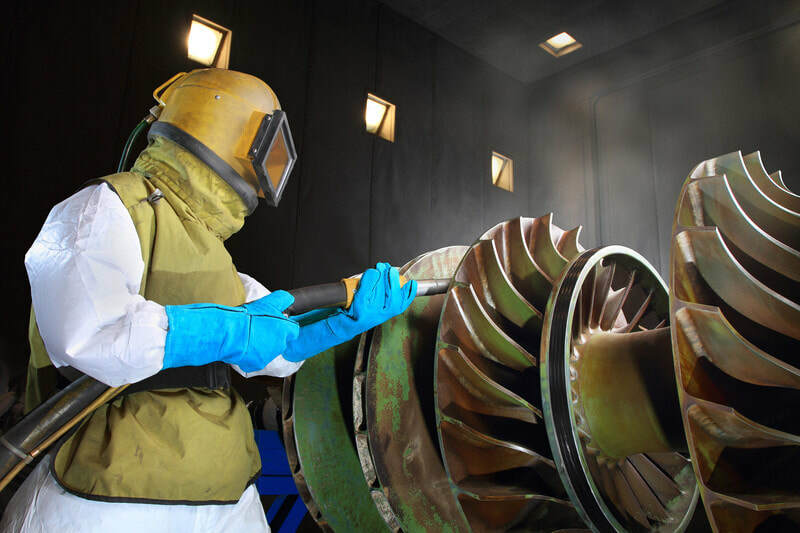 ​Dry ice blasting is an alternative media for improving the surface layer of machinery and more metal surfaces. We use this technique to blast many surfaces like food processing equipment and more to get all of the contaminants off of the machine. ​With the right procedures dependent on thermal conductivity, professional services are a must for removing contaminants such as E. coli, salmonella and various type of organisms from machinery. We have the professional experience and skill for the job. ​Our dustless blasting technique applies water to suppress dust while sandblasting. We use either a vapor and/or dry blast pot in conjunction with water stream from a wet head nozzle. This abrasive technique will create a less dusty atmosphere on any surface type that sandblasted. ​We provide blasting for machinery services which we apply the right media depending on the type of procedure that needs to be done. Applied with safe and effective techniques for machinery, we will improve the integrity of your machines. After your machine is cleaned, stripped and polish, it will be ready for restoration. ​We use sponge blasting as an innovative way to clean different metals like steel. Our sponge blasting technique provides a fast, yet safe, clean and dry surface preparation for restoration. This procedure provides a lows dust process with removal of all contaminants on the metal. ​One of our services is brick blasting. As your brick building or home has accumulated grime and soot, it will require a brick blasting cleaning. Brick blasting is highly preferred over the conventional wet acid cleaning of bricks. Brick blasting will effectively clean your brick facade, while safely restore the natural look of the brick. ​Wood blasting is a service we provide to efficiently clean wood with success for not damaging the wood. We keep the integrity of you wood when wood blasting by uses the right media for wood. Also our wood blasting service is advantageous for reshaping your along the grains. Blasting can be applied to all surface types despite the surfaces durability and it can even be applied to delicate surfaces such as desks, tables and even bathtubs. Professional blasters use environmentally safe material to blast and a lot of blasting techniques are done without the use of actual sand. ​The non-toxic materials are applied to provide a safe and healthier environment, which the utilization of material poses no threat to people's health, when touched, ingested or inhaled. Materials used for blasting such as sodium carbonate are non-toxic and highly popular for use by blasting or named otherwise. Sandblasting OKC would love to handle all your blasting needs!